Don’t let dental fear keep you from getting the dental care that you need. Even though dental technology has made dental treatments almost pain free, dental fear and anxiety still keep millions of people away from the dentist. Conscious sedation dentistry is a great option to calm anxiety and allow you to get the dental care that you need. What is conscious sedation dentistry? Contrary to its common name of “Sleep Dentistry”, you are not fully asleep. Conscious sedation uses a combination of medicines that allow you to enter a state of relaxation while still being awake. You won’t feel pain, but you will still be able to respond to your dentist’s questions and instructions. Depending on your particular treatment, conscious sedation dentistry can include 3 components. Imagine undergoing a complex dental treatment like a root canal or oral surgery. When your treatment is done, you have no recollection of how long it took, the pain, or the discomfort you feared. Conscious sedation allows you to recover quickly and to return to your daily activities soon after your procedure. Our goal is for you to be comfortable while receiving your dental treatment. What should you expect from your sedation dentist? From the very first interaction, whether it’s in person, by email or phone, you will be greeted by a team of dental professionals who understand and empathize with the very real nature of your fears. They will listen to your story and appreciate the magnitude of your fear. At your first visit, we will assess and then discuss all treatment and sedation options with you, design a plan of action that will bring you the care and comfort you need. Often under sedation, all treatment can be completed in one comprehensive visit using safe, sedation options. 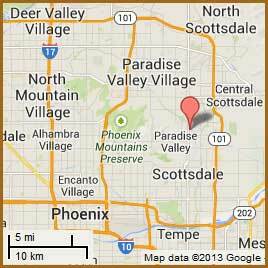 Paradise Valley, located as part of Scottsdale, is a beautiful location it is a resort town. It is only 10 to 12 minutes from the airport. It is a town that has 300 days of Sun out of the year and the bluest skies you can imagine. If you’re ready to discover truly relaxing conscious sedation dentistry, general dentistry, and other cosmetic dentistry services, contact Dr. Kidess today at (480) 991-2290 to schedule an appointment.